Hasui Kawase (川瀬巴水) was a traveler as much as he was an artist. 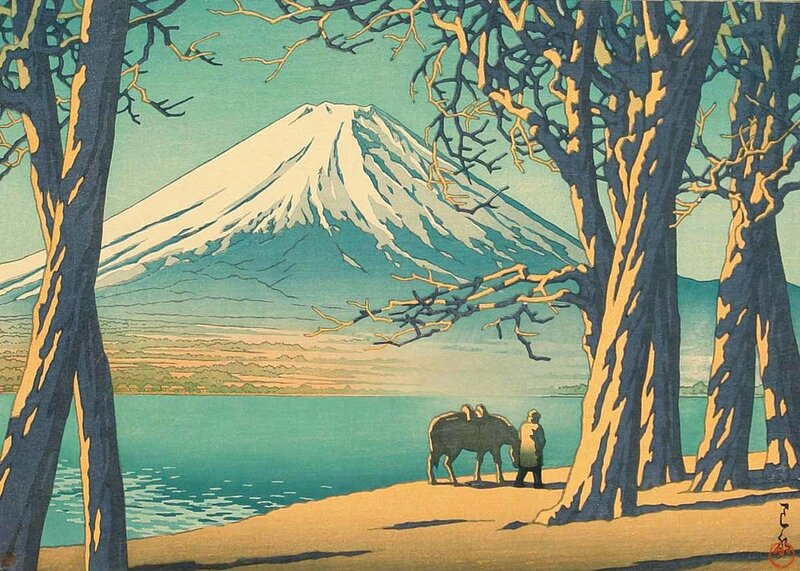 A artistic icon of Japan fuelled by his love of the nation’s landscape and discovering new places, this woodblock print artist captured Japan quite unlike anyone that came before. His name may not be as well known as some of Japan’s other creative talents, nevertheless take a look at these Hasui Kawase prints and you’ll find he is one man worth getting to know a little better. Beginning with the basics, it’s important to know a little context before diving straight into Hasui Kawase’s well-travelled, artistically groundbreaking and endlessly fascinating career. Born Bunjiro Kawase in Tokyo in 1883 to a rather average family, son of a silkbraid merchant, Kawase’s artistic ambitions were clear from a young age, but were rather beaten down by his more conservative family. His parents discouraged him from trying to dive deeper into the seemingly frivolous art world, and instead encouraged the young man to take the reigns of the family’s wholesale business. After his sister and her husband took over the business, Kawase was freed from the shackles of regular business life and decided to pursue his artistic ambitions. In his mid-20s, he reached out to Nihonga legend Kiyokata Kaburagi in the hope of studying under his guidance. Kaburagi suggested Kawase study western art, which he did for a couple of years before returning to Kaburagi to perfect the form. Kawase’s young life set up what would become an illustrious career. Western influence, the need to be freed from the constrains of regular life and the appreciation for the traditional art-forms of Japan became three integral aspects of Kawase’s artwork which we’ll explore through both images of his work, and the stories which have been written about this legendary Japanese art icon. What is Shin Hanga, and how is it different to Ukiyo-e? The terms Nihonga and Ukiyo-e woodblock prints are ones thrown around often when speaking about Japanese art history and ones you’re probably in some part quite familiar with (if you’re not sure about Nihonga, take a look at our Concise Guide), but there’s a chance that the term Shin Hanga may be a little more foreign. Shin Hanga (新版画 new block print) is the title given to work by the new wave of ukiyo-e artists that emerged during the 20th century. During this time (the Taisho and Showa periods) a fresh generation of artists came to the forefront of the arts scene inspired in equal parts by the nation’s rich legacy especially during the Edo and Meiji periods and the bourgeoning accessibility of the outside world. Typically incorporating western elements (most predominantly from European Impressionism) into classical Japanese forms, these artists crafted a hybrid style which came to be known as shin hanga. Shin Hanga artists often present an idealized version of Japan, check out these 8 Wonders of Japanese Architecture, and 12 Must-See Masterpieces of Cherry Blossom Art. Taking this relatively early Hasui Kawase print we can quite easily see the key elements that define the shin hanga form. Let’s break it down beyond the main obvious difference from more classic form, which is its setting: the US. Here we have the delicate coloring of traditional Japanese woodblock prints, soft floral pinks and vibrant greens framing the rippling pond. Turn an eye now to the style of painting and it’s easy to see a unified link between classic style landscape imagery and what we see here, introducing one of Japanese art’s most famous motifs, the cherry blossom (sakura). Kawase drew inspiration from all the greats of ukiyo-e prints. Check out The Stories Behind Yoshitoshi’s Influential 100 Aspects of the Moon, and Kitagawa Utamaro: Discover Japanese Beauty Through his Masterpieces to find out more! In his professional artistic career, Hasui cut his teeth as a commercial artist. It's a path purists may dismiss, however it’s this experience you can quite easily argue helped Kawase shape his original authentic style. Simple clear lines, bold imagery and a passion for presenting realism in a fun and attractive way, Kawase’s accessibility was one of his many strengths. You can see Kawase’s commercial training in this piece which was crafted later into his career. A classic, woodblock print; this image is a rather straightforward one, it’s a depiction of two ducks (a popular animal both in Japanese and international design in the 1950s) making their way along a deep indigo blue pond. Straightforward, rather non-descript and lacking any major geographical context it’s an image that one could assume would sell as well overseas as it would Japan. In fact, by the time the shin hanga movement was in full swing, ukiyo-e was considered within Japan to be a rather commercial creation rather than fine art (although the foreign market still considered it as such). Unlike many of the ukiyo-e artists that went before him, Kawase was rather adverse to recreating images of landscapes he hadn’t yet seen first hand. It was a commonly accepted practice for many ukiyo-e artists to recreate images from other painting or artworks, but for Kawase this inauthenticity just didn’t fly. As a creator, Kawase was so hell bent on being honest with his work that’s quoted as saying “I picked places to sketch that didn't require that I omit a single tree or blade of grass” – in other words he didn’t aspire to paint the perfect landscape, but rather find the perfect landscape and recreate it. This artistic ideology - and perhaps an acting out against a youth spent working in a business that he did not enjoy - sent Kawase on seemingly endless journeys across the nation throughout his lifetime. The following images are just a small snippet of the incredible landscapes he found himself in. Kawase was not the first woodblock artist to travel the country for inspiration. Take a look at Hiroshige’s 53 Stations of the Tokaido, and Hokusai’s Iconic Views of Mount Fuji. Taken from the vivid series Twenty Views of Tokyo, and one of a number of dedications to his home city, this Hasui Kawase print depicts a snow-swept Zojo Temple in the dead of winter. Using classic ukiyo-e style motifs (most specifically the main figure) this picturesque scene can be visited in real life, just head to the Shiba Park located in the Shiba neighborhood of Minato. Not long after the creation of the series Twenty Views of Tokyo, Kawase continued on his pilgrimage across the country. As he began to reach a more mature age, the passionate traveler often opted to explore places a little closer to his home city, and one such place is the temple-populated city of Nikko. If you’ve ever visited this mountain-surrounded spiritual hub you’ll agree that it provides excellent artistic fodder. This tightly cropped image is a recreation of the beauty of Tosho Shrine in all its bold colored and thick lined glory. While the previous print featured bold coloring and thick lines, this image created around two years later is a perfect example of the diversity of Kawase’s talent. The masterful use of color, blending the sky from deep blue to light blue creates a refreshing crisp cool atmosphere, one that can only be fully represented if you’re felt the cool spring water droplets on your skin yourself (which we can trust Kawase did). You can find Gokoku-ji Temple in the Bunkyo ward of Tokyo. Kawase has been quoted as saying “the landscape I saw before me came to look like a print” and looking at this perfectly composed image of Sanno Shrine it’s easy to picture him stepping to the side of this powerful structure and admiring its architectural beauty before furiously scribbling away. It’s here in the reflection of the trees in the glistening water-soaked footpath that Kawase’s super realist approach to creating works is at its best. It’s been relayed in history books that Kawase suffered from rather poor eyesight, which is surprising given the incredibly vivid imagery he managed to recreat throughout his career. Despite these battles, he was still able to produce multi-layered landscape images as detailed and unique as this snapshot of the sunrise-stained sky of Arayu in the morning. The composition, color and emotion in this image feels like a still frame from an anime film, leaving the viewer practically begging to see the rest of the story. 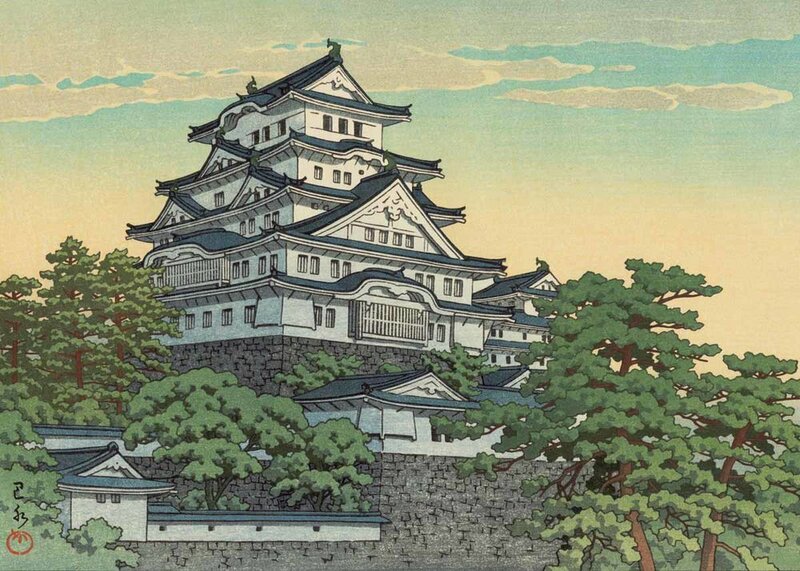 Finishing the series for this piece is Kawase’s incarnation of the iconic Himeji Castle. Found in Himeji in Hyogo Prefecture this castle is arguably one of the nation’s most popular and stunning, stand proud and tall in its white reflective glory since the mid-1300s. As an artist Kawase’s incredible talent was perhaps best embodied by the nihonga painter Ito Shinsui who called him “a poet of the emotions of travel.” Creating fully formed prints from small on-the-spot sketches throughout the country, Kawase’s legacy continues to inspire travelers, artists and lovers of Japan today. If you feel inspired yourself, check out this guide to Himeji Castle. Which image of Japan makes you want to see for yourself? Let us know in the comments below.